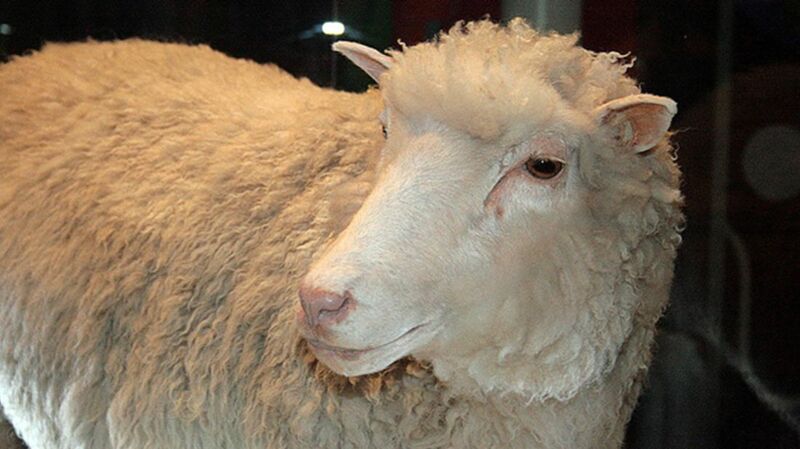 Dolly the sheep (named after the fabulous Dolly Parton) was the first animal to be cloned from an adult cell, making her the most famous cloned animal in the world. Before Dolly, a number of other animals had been cloned from the DNA of embryo cells; Dolly was special because she was cloned from an adult cell, proving that whole clones could be created from a single adult cell that had one particular function—a huge leap for science. Dolly was born in 1996 and lived out a lovely existence at the Roslin Institute at the University of Edinburgh, Scotland. She gave birth to a number of lambs, proving that clones can reproduce naturally. Unfortunately, the cloning process slightly shortens the chromosomes, and since Dolly was cloned from a 6-year-old sheep her lifespan was somewhat shortened. She was put to sleep in 2003 after suffering from arthritis and lung problems. Since Dolly, many more clones have been created (horses, cows, mice, donkeys and even cats), as the process becomes better understood. Where to see Dolly: After Dolly died she was stuffed and is now on display at the National Museum of Scotland in Edinburgh. Cher Ami was a brave carrier pigeon who delivered messages for the U.S. Army Signal Corps in France during World War I. One of 600 Black Check carrier pigeons working for the Signal Corps, Cher Ami delivered 12 vital messages across the battlefields of Verdun, France. On her last mission, on October 4, 1918, the plucky pigeon was hit by enemy fire and suffered an injury to her breast and leg, but still she flew on, returning to her loft and delivering the crucial message that brought rescue and relief to 194 soldiers from the 77th Infantry Division who had become isolated from their comrades without food or ammunition and were under friendly fire. Cher Ami was sent back to Fort Monmouth in America but died in 1919 from her injuries. For her brave service she was awarded the French Croix de Guerre with palm. Where to see Cher Ami: The stuffed body of Cher Ami (replete with her damaged leg) can be seen at the Smithsonian National Museum of American History in Washington D. C.
On January 31, 1961 Ham the Chimpanzee became the first hominid to go into space when he blasted off from Cape Canaveral. Ham had been captured in Cameroon and was one of 40 chimps taken to the Holloman Air Force Base for training and selection. Ham was trained to pull a lever when he saw a flashing light, a task which he successfully carried out during his 16-minute, 39-second-long flight. After his pioneering spaceflight, Ham went to live out the rest of his 17 years at the National Zoo in Washington D.C.
Where to see Ham: Ham’s grave is at the International Space Hall of Fame in New Mexico. The sad story of the dodo is one of the most famous of all extinctions. The large flightless birds were endemic to the island of Mauritius in the Indian Ocean. Discovered by Europeans in 1598, they were at first hunted for their meat, but since they were not very tasty, their decline was probably more likely caused by the cats, dogs, and rats that the Europeans also introduced to the island. By 1680 the poor dodo was extinct. Specimens of the bird were much in demand in Europe, tempting collectors to bring dodo remains back home with them. One of the most famous specimens was the dodo of celebrated 17th century collector John Tradescant. It was first displayed in his London museum before becoming part of the Oxford University Museum of Natural History, where the mummified head and foot are still on display today, providing the only soft tissue specimen (crucial for DNA research) in the world. Where to see dodo bones: No complete dodo specimen exists, but a dodo skeleton can be seen at the American Museum of Natural History in New York. There once was a Canadian black bear named Winnipeg who lived at London Zoo—and one day a man named A. A. Milne brought his young son, Christopher Robin, to see it. The boy was enchanted and fed the little bear honey, then named his own teddy bear Winnie in her honor. This encounter inspired A. A. Milne to create the now-beloved character of Winnie the Pooh, a bear who captured the hearts of many since the first story in which he featured was published in 1926. The real Winnipeg (originally named for the Canadian city) remained a favorite with Londoners and was treated with honey and sweets by her many admirers (a fact proven by the bear’s skull, which shows evidence of serious dental decay) until she died in 1934. Where to see the real Winnie the Pooh: Winnipeg’s skull was recently rediscovered and is now on display to the public at the Hunterian Museum in London. Back in the days when battles were fought on horseback, a reliable steed was key to victory. Napoleon is said to have used 130 horses over 14 years, but his most famous was Marengo, the horse he is thought to have ridden into the Battle of Waterloo (among other earlier battles). Marengo was captured by the British after Napoleon surrendered. He lived about 16 years after the battle, and his skeleton was preserved after his death; you can now see it in London. Marengo is not the only one of Napoleon’s horses on display—the Musée de l'Armée in Paris displays the taxidermied remains of Vizir, the Arabian stallion that accompanied Napoleon to Saint Helena. Where to see Marengo: He is now on display at the National Army Museum in London.